Home News & Update English Tide markets the stories of seven socks! If socks had feelings just like humans do! How would your sock speak about the treatment done to it? 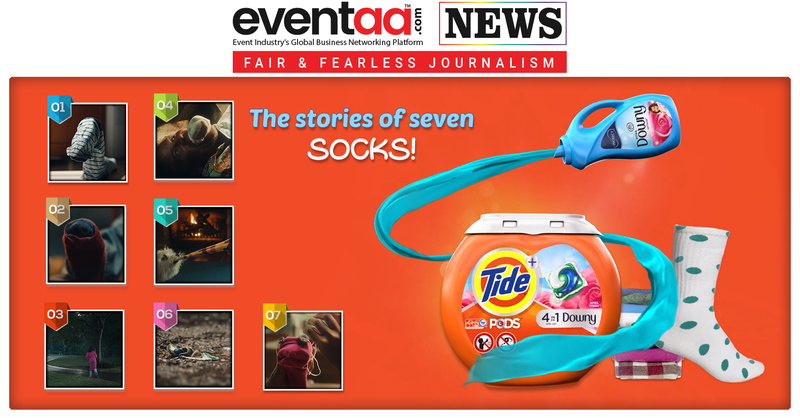 Tide’s one-minute advertisement video shows stories of seven socks speaking about how their masters ill-treat them! The first sock starts the story by popping down from a bucket full of clothes, while its master is searching for it in the washing machine and then in the bucket. The second one is trying hard to breathe after the abuse done to it by putting it into the shoe-jail while its master is trying to experiment with varied shoe sizes for buying a pair of shoe. The third one is ill-treated on the road by its master and bumped into a small pit of water that gets collected after monsoons. The fourth one is used to shut up the kidnapped’s mouth; the fifth one is shown stretched by a dog’s mouth, while asking her master who is busy reading a book, to attend him. The sixth one is assumed to have been given to a kid for his entertainment, is thrown away carelessly and a car is shown running above it. Finally, the seventh one is creatively being used to make a puppet's face and eyes.